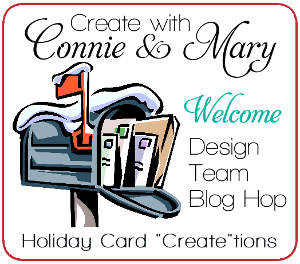 Oh…I just can’t believe it…we have come to the END of Create with Connie and Mary Holiday Card “Create”tions and it is time for our LAST design team Blog Hop! The team spent another week doing Christmas card sets and you know what? If you are looking for ideas…it’s not too late to subscribe! If you are going forward through the hop you arrived here from Natasha Zandbergen’ blog Inking Out of the Box. Isn’t it fun seeing all of the Cafe’ Gift Bags? I know I’m getting some GREAT ideas! This week we are all using the Cafe Gift Bag. If you haven’t see them yet, they are really nice…they are lined so that you can put food in them and it not ‘leak’ out. I used the photopolymer Christmas Bliss set for my card set so I used it for this. I also featured the All is Calm dsp. I like to keep things ‘clean and simple’ so I decided to do the same for my bag but just add some tags to decorate the front. The blue tag is 2 3/4 x 6, the green is 1 1/2 x 4 and the Whisper White is 1 1/4 x 5 1/4. On the Whisper White I silver embossed the greeting and cut everything into tag. I layered these together and add Lost Lagoon 3/8″ Silky Taffeta Ribbon. I wanted just a little ‘extra’ on my ‘tag’ so I add an All is Calm Snowflake embellishment using White Baker’s Twine. I added a strip of the dotted dsp 1/2 x 3 1/4 along the top and some of the Silver Washi Tape along the bottom. This would be a VERY simple thing to do if you were making a bunch of gift bags and really could be for ANY occasion and in ANY colors! Okay…I just KNOW Melissa Davies did some WONDERFUL for her bag so head on over to Rubberfunatics! 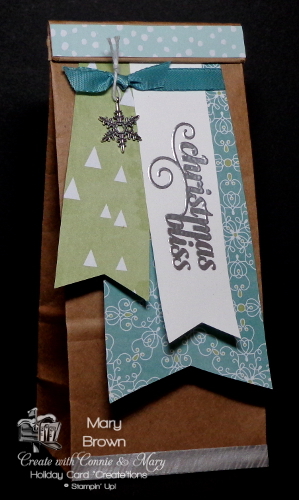 This entry was posted in 3D, Create with Connie and Mary and tagged Christmas Bliss. Bookmark the permalink.